Walk for 20-30 minutes is an excellent way to burn calories. 15 minutes of Zomba dance can easily help you burn 150 calories. You can do aerobics for at least 30 minutes every alternate day. Workout on trampoline (it is a device consisting of a piece of taut, strong fabric stretched over a steel frame using many coiled springs) for 20 minutes is equivalent to 1 hour jogging on the track. Within 5 minutes you can burn near about 150-200 calories. Walking up the stairs heightens metabolism in your body. All the panting and gasping for breath suggests that you’ve invested energy while climbing stairs. In addition, you also tone your legs. Remember, calorie burn totally depends on your weight. So next time you have an option between escalators and stairs, you know which one to choose. Don’t complain if your mother asks you to walk her to the supermarket because walking is a brilliant way to burn calories. Ask your friends to accompany you for a brisk walk. Do it about 20-25 minutes; it would make you palpitate but it’s worth an effort. Jogging is a low impact exercise. Make sure you are empty stomach before you hit the jogging track and wear appropriate clothes because you’re likely to sweat a lot and lose clothes will ensure proper perspiration. Who says running is only done by athletes on race tracks? 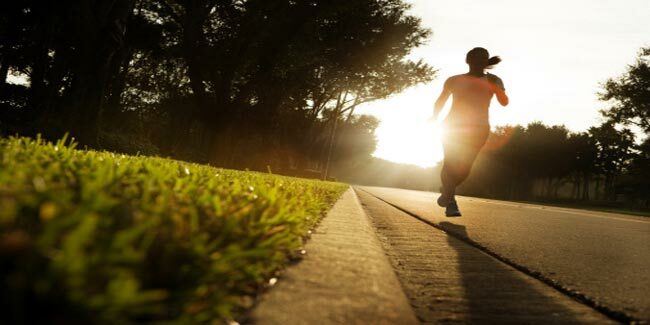 As a beginner try running at the pace of 1.5 km in 15 minutes and gradually cut down to 10 minutes. Running improves your cardiovascular system and your stamina increases manifold. A warm up, however, before you start running is essential. So, jog for a while and then start running. Known to be a stress buster, dancing will disallow accumulation of extra calories and help you become lean and flexible. 15 minutes of Zomba dance can easily help you burn 150 calories. So, shake your leg and stay fit! According to a study done by the University of Switzerland, drinking green tea helps you burn calories. You may drink 3-4 cups of green tea in a day. Aerobics is a high-intensity exercise so ask your physical instructor to include it in your exercise regimen. Make sure you do aerobics for at least 30 minutes. Swimming helps you burn calories at the rate of 3 calories a mile per pound of your body weight. Swim to tone your body and burn extra calories that you consume. Do several household chores simultaneously. For instance, make your bed, do dusting and cleaning, play with your kids, make the bed, put laundry in the dryer. It will keep you on your toes, burn calories and reduce chances of any weight gain. If you adopt such lifestyle choices you would automatically reduces health risks associated with calorie gain such as hypertension, high blood pressure and cholesterol levels. So, mobilize your efforts and get going!